For me, no morning commute is complete without a podcast. As I make my way downtown I am transported from the busy DC streets. Suddenly, I am getting coffee with the inspiring lady bosses who talk creative entrepreneurship, or on the couch dissecting fan theories with my fellow Game of Thrones fans. The genre that captures my attention the most, however, is true crime and spooky stories. 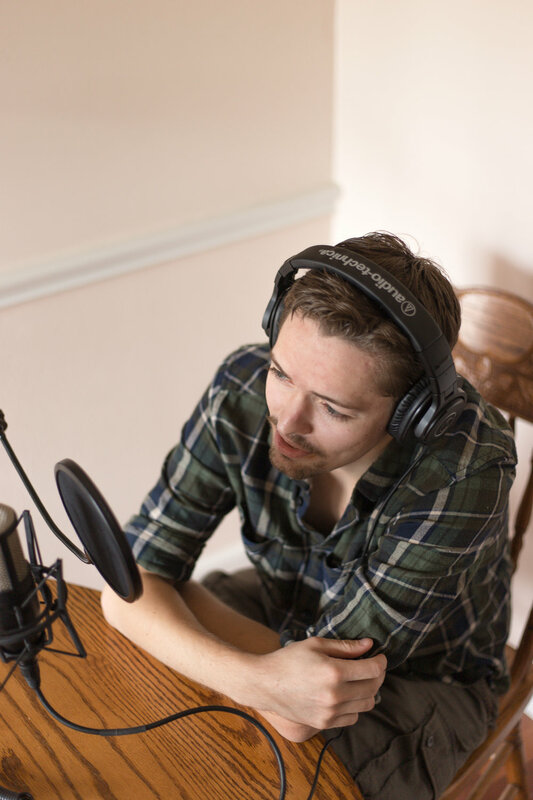 I recently had the chance to catch up with my friend H. H. Keegan, the creative mind and vocal stylings behind Down Home Fear (DHF), a podcast about true crime and strange happenings in the American South. We spoke about H. H. Keegan’s inspiration for the podcast and he provides advice for anyone thinking of starting their own podcast. I also did a portrait session with H. H. Keegan, capturing him doing two things he loves: making the podcast and playing his guitar. He writes and plays all the music in the podcast! Interested in hearing more about DHF specifically or making a podcast? Read our interview below! What prompted you to start the Down Home Fear podcast? I've been interested in true crime and forensic psychology since I was a kid and I wanted to share that fascination with other people. There are also lots of specific stories that are mind-blowingly bizarre and I feel like more people need to be made aware of them, so that was -- and still is -- a big motivating factor as well. What podcasts, if any, do you draw inspiration from? The main influence would be This American Life. I was diehard fan of this show throughout my teenage years and Ira Glass definitely left some sort of permanent imprint on the way I approach crafting stories for DHF. It showed me that a conversational tone mixed with a solid story structure can be effective and engaging. And, of course, the musical elements throughout the segments definitely stuck with me too. In general though: when I listen to any podcast I make mental notes of what works and what doesn't (at least in my opinion), and find ways to incorporate that feedback into my own show. Do you have any advice for someone interested in starting their own podcast? Down Home Fear is still very much in its early stages, but if there's anything I've learned over the last year it's probably: Be flexible and experiment to find a good show format that works best for you, learn how to properly engineer and mix vocals (and invest in a good quality microphone), and be ready to commit a fair amount of time to it. There are SO many podcasts that get started, run for a couple of episodes, and then disappear forever because the hosts get bored with them or can't make the time commitment or whatever. What episode do you recommend new listeners start with? "DHF Episode 16 -- Nicholas Barclay & Frederic Bourdin" is my personal favorite, and the story it discusses was actually one of the main inspirations behind starting DHF -- it's weird, creepy, and has a pretty shocking twist. But "DHF Episode 11 -- Casey & Caylee Anthony, Part 1" is the fan favorite. It gained a fair amount of attention on true crime web forums because of its accurate and highly detailed examination of Casey and her trial. What are your favorite non-true crime/spooky story podcasts to listen to? I actually mainly listen to comedy podcasts these days. Listening exclusively to true crime shows as well as hosting my own would just be too much. Some of my favorites are: Uhh Yeah Dude (basically just two guys discussing offbeat and hilarious news stories), Blank Check (a great movie review podcast), and Hound Tall (wherein an expert on a given subject discusses said subject with standup comedians). You can listen to Down Home Fear and explore true crimes and strange happenings of the American South on iTunes, SoundCloud (https://soundcloud.com/downhomefear) or your preferred podcast streaming service! Skyler Anne Photography LLC is a wedding and portrait photography business, serving DC, Virginia, Maryland, and beyond. I'm Sky! Brunch lover, dog mom, wife, traveler, & photographer. Thank you! Looking forward to hanging out in your inbox soon! Have questions? Feel free to contact me. Together we can craft the ideal session for you.